Steve McQueen’s red and silver 1971 Husqvarna Moto-Cross 250 motorcycle will be auctioned on December 21, beginning at 11am P.T. at the Profiles in History offices in Calabasas, CA. The motorcycle comes with its original Med-International Husqvarna dealer invoice, which reflects McQueen’s production company as the buyer, and the original Manufacturer’s Statement of Origin document, which is dated October 19, 1971. The motorcycle itself has been restored and is in excellent running condition. 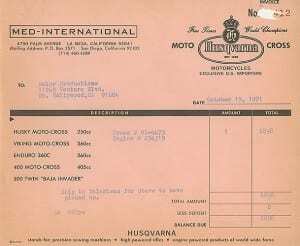 McQueen first became associated with the Swedish brand Husqvarna in the early 70s. Since then, it was featured in many of his movies and photo shoots. He famously rode a Husky in the 1971 film On Any Sunday. The film created thousands of first-time bikers across the U. S. and increased Husqvarna sales overnight. The last McQueen Husqvarna to be auctioned set a world record when it sold for $144,500 in 2011. Profiles in History will provide internet-based bidding to qualified bidders in real-time on the day of the auction. For more info, visit www.profilesinhistory.com.